← Are StingRay cellphone surveillance systems used by Vancouver police? Two more derailments of oil-bearing trains last weekend, these two in Wisconsin, have prompted the Quinault Nation to issue yet another warning about the dangers inherent in such transport. “The frequency of these train crashes combined with the danger they pose to people and to the environment that sustains us should alarm everyone, everywhere, to the point that they take a stand against increased oil train traffic,” said Quinault Nation President Fawn Sharp in a statement on Tuesday November 10. Her declaration came after 13 cars of a Canadian Pacific Railway train derailed on Sunday November 8, puncturing a tank car, which leaked oil. That accident unleashed about 1,000 gallons of crude oil, and residents of Watertown, Wisconsin had to evacuate. Of the 110 cars, 109 were carrying crude oil, according to the Associated Press. “The company claimed no oil reached a waterway, neglecting to report damages to land or underground aquifers,” the Quinault statement noted, adding that 35 residents had to leave their homes. The evacuations were conducted as a precaution, and the residents have since returned, Reuters reported. The company said a broken rail had caused the incident. 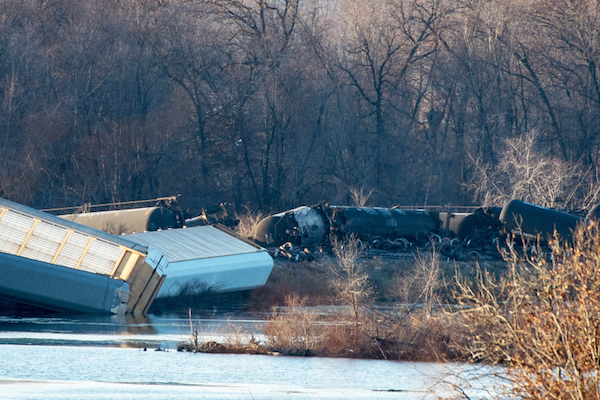 The second accident involved 25 cars on a Burlington Northern Santa Fe (BNSF) Railway Co. train that derailed about 200 miles away near Alma, Wisconsin, dumping about 18,500 gallons of ethanol into the Mississippi River, according to Reuters. Sharp said that such accidents underscore the dangers of transporting oil and other chemicals by rail, as well as the difficulties inherent in responding to such emergencies, especially in remote areas. The Quinault and numerous other tribes, including the Swinomish, have spoken out strongly against the transport of oil by rail, especially through remote, ecologically sensitive areas. “Although railroad crews say they stopped the leaks from the five tanker cars near Alma and placed containment booms along the shoreline, and are attempting to downplay the impacts, that remains questionable,” Sharp said, pointing out that 15 refineries and port terminals are being planned, built or are already operating in Oregon and Washington alone. Posted on November 12, 2015, in Oil & Gas and tagged Canadian Pacific Railway, oil spill, oil train derailment, oil trains, Quinalt, railway pipeline. Bookmark the permalink. Leave a comment.